Scotland Yard has insisted its officers did make clear to Commons officials that they could not search an MP's office without permission. The raid and seizure of equipment from Tory frontbencher Damian Green's office last week has prompted anger among MPs. Speaker Michael Martin told MPs that police did not tell the Serjeant at Arms she did not have to allow it. But in a letter police chief Bob Quick said officers "were satisfied" she knew she could insist on a warrant. Home Secretary Jacqui Smith explained her role in the events last Thursday, in a statement to MPs earlier. During the debate that followed, her Tory shadow Dominic Grieve said Mr Quick's letter was "incompatible" with the Speaker's statement to MPs in Wednesday. The Speaker had said he did not authorise the search and had not been told police did not have a warrant. He told MPs: "I have been told that the police did not explain, as they are required to do, that the sergeant was not obliged to consent or that a warrant could have been insisted upon." But in his letter to the home secretary answering a number of questions about the search of Mr Green's offices, assistant commissioner Quick said Serjeant at Arms Jill Pay had been informed that they had to first seek consent before carrying out a search. "The officers explained the nature of the investigation and the purpose of the search and were satisfied that the serjeant at arms understood that police had no power to search in the absence of a warrant and therefore could only do so with her written consent or that of the Speaker," he said. Ms Pay signed a consent form allowing police entry, without consulting the clerk of the house Michael Jack. Mr Grieve said the police letter was a "masterpiece of obfuscation" on whether or not guidelines had been followed and contradicted the Speaker's statement. The Conservatives have also raised concerns about an inquiry conducted by a committee of MPs into the events, after the government said it would begin work after any police inquiry was concluded and any criminal charges completed. Harriet Harman: "It's not my responsibility to choose the Speaker"
Shadow Commons leader Theresa May said that bore "no resemblance" to plans outlined by the Speaker who, on Wednesday, pledged a "speedy and immediate" inquiry to report back "as soon as possible". "It might not meet for months," Ms May told MPs. 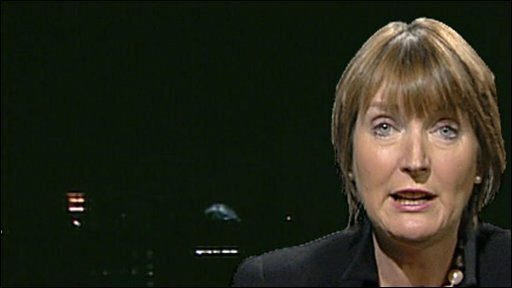 Commons leader Harriet Harman said it would not be "wise" to set up a probe while police inquiries continue. Ms May also said an instruction that it would reflect the political balance of the Commons was wrong as it meant it would be "dominated by the government". The Liberal Democrats say they will boycott the inquiry, which they say has effectively been "neutered". Ms Harman said the terms of the motion were "amendable" but added: "I don't think it's wise to set up a concurrent investigation when there's a police investigation underway." She said she wanted any debate to keep in mind four principles - to protect MPs in doing their job, to remember MPs were not above the law, to support the independence of the police and to support the neutrality of the civil service. She was met with cries of "cover up" and "rubbish" from some MPs as she said it was important to get the balance right and support those principles. "What we need is a cross party, whole House approach on these issues and not a party political divide," Ms Harman said. The Speaker has said there will be a debate on the issues around Mr Green's arrest next Monday. But the Conservatives say at three hours, it is not long enough and there should be a full day's debate. Some MPs have openly called for the Speaker to go and Ms Harman refused to say on the BBC's Newsnight that she had confidence in him. But Gordon Brown has said he has a "great deal of confidence" in Mr Martin. On Wednesday Conservative MP Richard Bacon said the Speaker should resign, given that he had "failed in his fundamental duty to protect Parliament". 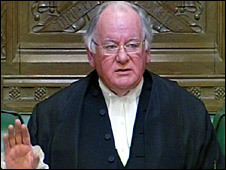 But Labour MP Stephen Pound backed Mr Martin and Serjeant at Arms Jill Pay "absolutely" to remain in their jobs telling BBC Radio 4's Today programme the Speaker's critics were being "wise after the event". He added: "The Conservative MPs in Damian Green's office - they didn't ask for a warrant when the police turned up." Items including computer files were confiscated during raids on all Mr Green's homes and offices last Thursday. After the news broke last week that four addresses had been raided, Scotland Yard said it had had warrants for all of them. But, shortly before the Speaker's statement, acting Metropolitan Police commissioner Sir Paul Stephenson revised the detail, saying just three warrants had been issued, while the Commons search had been "consensual". When asked about this, a Scotland Yard spokesman said there had been "no deliberate attempt to mislead". Mr Green was held on suspicion of conspiring to commit misconduct in public office and on suspicion of aiding and abetting misconduct in public office. The MP denies any wrongdoing.